(Adelle M. Banks | Religion News Service) People gathered for an Alzheimer’s caregiver support group pass around a photo album one man shared of his wedding to his wife, who now is in a late stage of the disease. 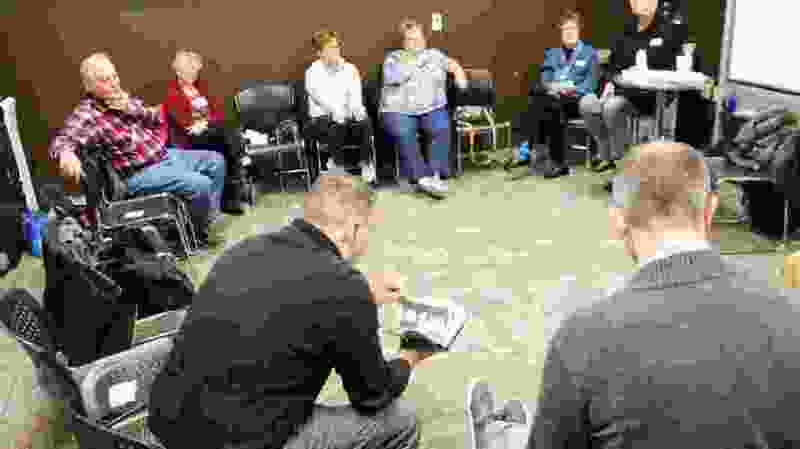 The group met on a campus of Southeast Christian Church in Louisville, Ky., on Nov. 28, 2018. Louisville, Ky. • They sat in a circle in a room usually used by high schoolers and talked about the people they loved who no longer recognized them or who had died forgetting the names of family caregivers in their last days. Meyer, who was married for “15 days shy of 50” years, fondly recalls his wife, who was a homecoming queen and played in her college band before they raised three children together. For 10 years, they traveled through her dementia together, at first attending couples’ counseling as they adjusted to her condition. He later went on his own to as many as three support groups a month to share experiences with other caregivers. The group members who meet on the megachurch’s southwest campus talked about the family bond that has formed among them as they confidentially share what they’re going through. Their meeting concluded that November day with heads bowed, eyes closed, tears dabbed.